Scarce nautical chart of Cape Fear, Wilmington, and Shallotte, North Carolina. United States - East Coast Old Topsaid Inlet to Shallotte Inlet including Cape Fear. 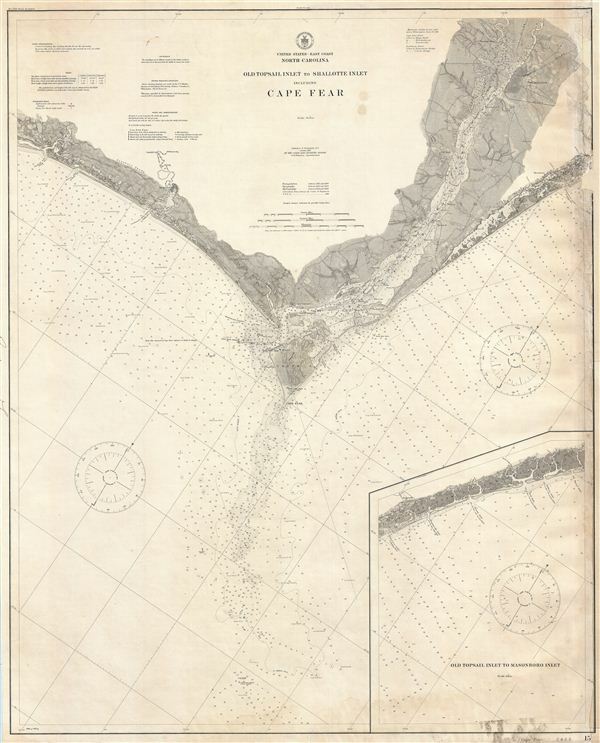 A scarce 1913 U.S. Coast Survey nautical chart or maritime map of Cape Fear and vicinity, North Carolina. The map covers from Old Topsail Inset (which appears via an inset in the lower right quadrant) to Cape Fear, then to Shallotte Inlet. It also details the course of the Cape Fear River as Far as Wilmington, which is shown in some detail. The chart offers a wealth of detail including impressive inland detail and countless depth soundings. Shading further highlights shallow areas around Smith Island and the Frying Pan Shoals - where instead of fathoms, all sounding are represented in feet. Various towns are noted including Wilmington, Southport, Old Town, Masonboro and Wrightsville. The upper left quadrant offers a wealth of practical information for the mariner, including notes on tides, submarine bells and soundings. Published by the United States Coast and Geodetic Survey under the superintendence of O. H. Tittmann. Good. Map has been professionally restored and backed with fine linen. Repaired damage to right margin. Minor discolorations here and there - note expecially lower right quadrant.